Nano- to Meso-scale science of liquids and their solids : research : measurement, analysis and modeling. We study the structure, dynamics and phases of nano-structured	to micro-structured liquids and their solids. The techniques we are developing for nano-scale metrology are based on both physical thermodynamics (Gibbs equations) and on neutron and X-ray scattering. The properties of matter change considerably when the matter is structured on the nano-scale to meso-scale. In confined geometry the Gibbs Free Energy is greatly modified, resulting in changes to parameters such as diffusion, transport and the temperature at which phase changes take place. We have now been studying the structure, dynamics and phases of nano-structured	to micro-structured liquids and their solids for more than 20 years, and are actively unraveling the behaviour of liquids in confined geometry, and at and near surfaces. 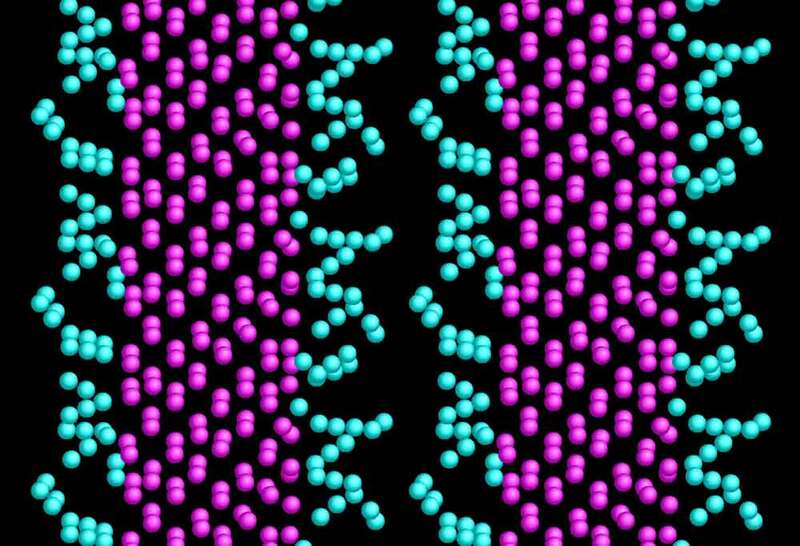 Even so there is much that we still need to understand about even such basic systems as water in a silica pore. Some of this basic research has been carried out at the University of Kent, some of the more recent work in conjunction with Heriot Watt University. Lab-Tools are continuing these investigations in conjunction with both universities, both in the Lab-Tools NMR laboratory and at central neutron scattering facilities. This research is of great interest in its own right, but also as needed to support the metrology development. Dr. Beau Webber has also been awarded a total of 88 days of neutron scattering time to aid these studies (23 days as main proposer), at the central facilities at the Institute Laue Langevin in Grenoble (ILL); Laboratoire Leon Brillouin (LLB), Saclay, Paris; at the Jülich Centre for Neutron Science (JCNS), Germany, and ISIS at the Rutherford Lab., to investigate this nano-science and nano-metrology. Direct analytic/numerical calulation of small angle neutron scattering from model porous systems, and their alignment to measured scattering results. NMR Cryoporometry is a technique for measuring pore size distributions that we originated at Kent and that I have extensively developed. Figure 1: 3D model of laminar silicon porous system, with surface films of liquid nitrogen - one timestep from a CASTEP ab-initio QM MD simulation. 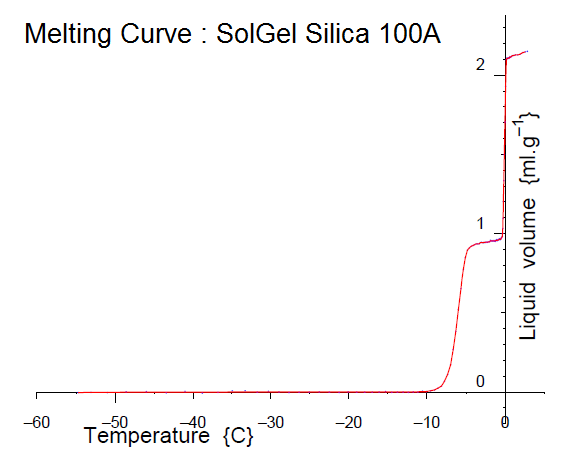 Figure 2: An example melting point curve, for water ice melting in nominal 100 Angstrom pore diameter Sol-Gel Silica. 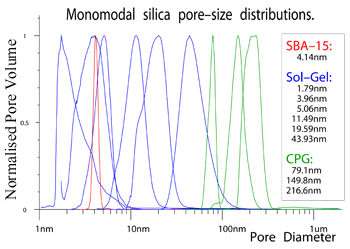 Figure 3: Normalised pore size distributions for selected porous silicas, as measured by NMR Cryoporometry. The intrinsic resolution of the technique is better than the red curve, for SBA-15, which is fully resolved. We have now extended the range of the technique from about 1nm to nearly 10µm. 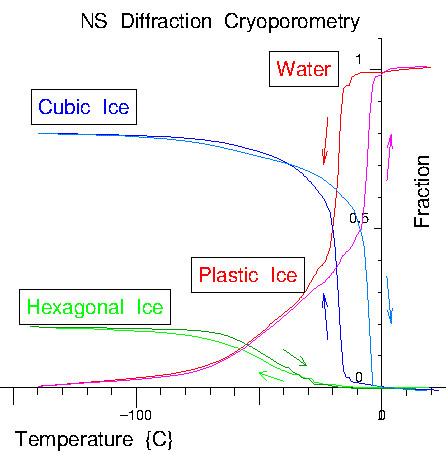 Figure 4: Neutron Diffraction Cryoporometry (NDC) - a technique which I originated for studying phases as a function of temperature. When in pores, water can remain a stable liquid (i.e. in an equilibrium state) more than 20C° below its usual melting temperature - for other liquids the effect can be even larger. Even when ice is formed under these conditions, it can become much more mobile than normal brittle ice, particularly near surfaces. We now partly understand this behaviour in these confined systems, at least on the larger length scales, in terms of the changes in the thermodynamic state - in particular, alterations of the local Gibbs Free Energy. However there are still less-well understood effects, such as the effect of pore geometry on the thermodynamic state. As one approaches the atomic scale there is a need to use tools that take into consideration the atomic nature of the system. We are now beginning to apply ab-initio quantum mechanical molecular dynamic calculations to throw more light on the behaviour of liquids and their solids near surfaces (see figure 1). Dr. Beau Webber was recently awarded measurement time on the nuetron quasi-elastic scattering spectrometer IRIS at ISIS, to further investigate the dynamics of these thin surface layers. Plastic ice in confined geometry: The evidence from neutron diffraction and NMR relaxation. J. Beau W. Webber, John C Dore, John H. Strange, Ross Anderson, Bahman Tohidi. J. Phys. : Condens. Matter 19, 415117, 2007, Special Issue: Proceedings of The International Workshop On Current Challenges in Liquid and Glass Science (The Cosener's House, Abingdon, Uk, 10-12 January 2007). A significant conclusion from both the NMR relaxation studies and the neutron diffraction cryoporometric studies is that plastic ice forms at ice-vapour interfaces, converting to hexagonal ice at low temperatures. EPSRC funded work has already indicated that for methane hydrate formed in the pore space of model systems, there is a hysteresis in the phase plots. There are numerous techniques for studing the metrology of surfaces. We are developing the application of physical thermodynamics and neutron and X-ray scattering techniques as tools for studying the metrology throughout the volume of a sample, on the nano-scale through meso-scale to micro-scale dimensions. We have completed many academic research projects and also industrial and commercial analysis projects for high-profile companies using the techniques that we have developed. Following the above basic research into the behaviour of liquids and their solids in confined geometry, in well characterised porous materials, we then apply this by imbibing these liquids into as yet uncharacterised porous systems, and use the knowledge that we have gained about the changes in their physical properties, when nano-structured, to deduce information about the host porous structure and metrology. More detailed information about NMR Cryoporometry is available by following the link below to our NMR Cryoporometry pages. Lab-Tools has measured pore sizes in a wide range of materials, and the technique can be applied to oil and/or water wet materials, and also to materials that can not be dried out without losing their structure. The Lab-Tools pore-size distribution measurement range extends from about 1nm to nearly 10µm. Please contact us ( Dr. Beau Webber ) to discuss pore size measurements on your samples. Prices are competitive, but depend on the number of decades of pore-size range to be covered, and precision needed, as these determine the duration of the measurement meeded, which can range from 2 hours to 36 hours. We frequently find these techniques may be preferable to more established methods such as BET gas adsorption or DSC thermal porisimetry. To transform a measured scattering to a metric of the structures in the sample, we create extended models of pore systems, and calculate the scattering using numerical integration. These show very good agreement with measured scattering, figure 3. Dr. Beau Webber has been awarded measurement time at the Institute Laue Langevin (ILL), on the D4 and D22 instruments, and this has enabled him to develop and verify his models. Dr. Beau Webber was recently awarded measurement time (as first user) on the excellent new wide-scattering range ISIS Target Station 2 instrument NIMROD, and 17 porous samples were measured on this most successful run, with very pleasing preliminary results. Simulation models are being run to match the results, and the models, results and conclusions will be presented in a paper. 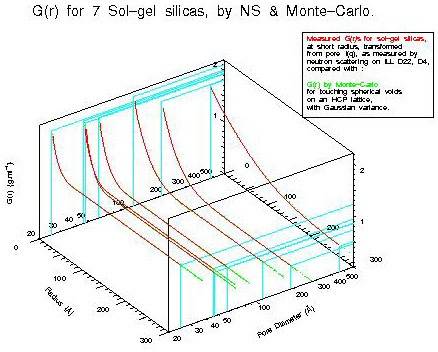 Figure 3: Fully density corrected radial distribution function measured for 7 sol-gel silicas (red lines), compared with that calculated for extended arrays of pores with Gaussian variance (green dots).